At this year’s imbX conference, it was announced that Singapore would test using solar energy to power outdoor public Wi-Fi hotspots at its island resort, Sentosa. Using solar energy powered Wi-Fi hotspots could eliminate the need for outdoor cabling, and instead enabling solar energy to transmit network connectivity between cell sites via microwave signals. Furthermore, solar-powered outdoor Wi-Fi deployments are cost-effective and are estimated to be 5 times faster than the traditional outdoor deployments. Skylab Networks, one of the companies involved in the trial, has integrated a proprietary software that tweaks the equipment on the occasion that any external factor impacts the hotspots’ energy consumption. For instance, if rain is forecasted, the solar-powered outdoor Wi-Fi hotspot gets alerted and starts storing solar energy before it rains. At full charge, the system can store 2.4 kWh of energy. Moreover, the solar-powered outdoor Wi-Fi system is also able to deactivate Wi-Fi signals when the Sentosa beach is empty. 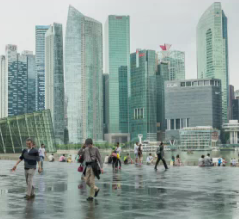 Sentosa, which is a flat and less penetrated area, was chosen for the trial on purpose, as deploying outdoor Wi-Fi networks in crowded locations with buildings and skyscrapers could interfere with signal transmission. The results of the trial will be revealed to the public when available during the course of the test.